David Letterman and his girlfriend thanked law enforcement officials for uncovering a plot to kidnap their 16-month-old son from their Montana ranch, saying they were "forever grateful." The man charged Thursday with hatching the scheme, Kelly A. Frank, worked as a painter at the talk-show host's 2,700-acre spread near the rugged Rocky Mountain Front. The 43-year-old Frank, according to police, had planned to hold the boy and his nanny for $5 million ransom. "The thought was to kidnap the nanny and the child so the nanny could take care of the child during this period of the kidnapping," said Mike Ferriter of the Montana Dept of Corrections. In a statement issued by the publicist for Letterman's production company, World Wide Pants, Letterman and his girlfriend, Regina Lasko, praised the FBI and local authorities. "We will be forever grateful for their tireless efforts and determination to vigorously pursue this situation," the couple said. Steven Rubenstein, a spokesman for World Wide Pants, said he could not comment on whether Letterman's family was in Montana at the time of Frank's arrest. The host of CBS's "Late Show" taped three programs earlier this week, but the network's coverage of the men's college basketball tournament pre-empted his Thursday and Friday shows. Ferriter said Frank had been working as a painter at Letterman's ranch west of Choteau in north-central Montana and apparently confided in an acquaintance earlier this month of his plan to kidnap Letterman's son and nanny for ransom. According to the affidavit filed by Teton County Attorney Joe Coble, Frank had told the acquaintance that he knew Letterman and his family would be visiting their Montana home soon, and that Frank had a key to the house, knew where the baby slept and intended to kidnap the nanny "so that she could take care of the child." The acquaintance contacted authorities Sunday, according to the affidavit. Sheriff George Anderson told the weekly Choteau Acantha newspaper that Frank was arrested the following morning at another area ranch where he was working. Besides the felony solicitation charge, Frank is charged with felony theft for allegedly overcharging Letterman for painting, and a misdemeanor charge of obstruction for lying to an investigator about the alleged plot. He was convicted back in 1999 for holding his then girlfriend against her will, reports CBS News Correspondent Trish Regan. Frank is jailed in neighboring Pondera County on $600,000 bail. It was not immediately clear whether Frank had an attorney. The Acantha said he did not have a lawyer present when he appeared in court Thursday. His father, Robert Frank, told the New York Daily News for its Friday editions that he hoped the authorities had made a mistake. "I didn't see this coming," the newspaper quoted Frank, 75, as saying. "I just can't imagine him even thinking like that. I don't think he'd ever seen Letterman in his life." Letterman bought the ranch in 1999. In 2003, a black bear broke into Letterman's home twice, then was captured and relocated after returning a third time. On Nov. 3, 2003, Lasko gave birth to the couple's son. 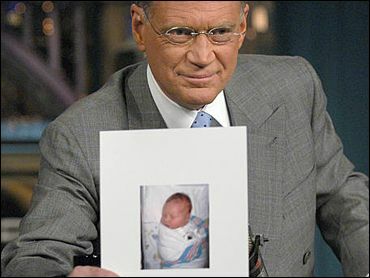 The boy, Letterman's first child, was named after the comedian's late father, Harry Joseph Letterman. For years, Letterman was targeted by a stalker who called herself "Mrs. David Letterman" and broke into his Connecticut house at least seven times.